In May I discovered that four Boy Scouts of Melrose Troop 68 had signed up to attend the new S.A.L.T. program at the Summit Betchel Reserve in West Virginia. The Summit Adventure Leadership Training is a five day program designed to give participants a chance to sample many of the activities found at the Summit, along with some training on how to promote the Summit in their troops, districts, and councils. I have never been to the Summit. I wanted to visit the base during the 2017 National Jamboree but things did not work out for that to happen. I decided to call the council office and check if they needed any adult leaders go to on the trip. They told me they were looking for leaders and if I was interested I should send in a “resume”. The last time I needed to send a resume to the council was when I applied to be a Scoutmaster of one of the troops for the 2001 National Jamboree. It took me week to get around writing a resume. As I was writing it I thought to myself, as I listed my Scouting accomplishments, this could work for me or against me. The council may decide to choose younger leadership or a couple Scoutmasters for this trip. Oh well, the decision was theirs. I sent it in and waited for a reply. For the next week I waited for a reply. To tell the truth, I was starting to have second thoughts about the whole thing. I would soon be 58 years old. Maybe I did not want to camp out for a week long trip anymore. I have not spend a week camping since I stepped down as Scoutmaster in 2011. The hot, humid, and possibly rainy weather known to be in West Virginia during July was another concern. I think I have grown a bit soft since I moved on to a committee position. I was also a little concerned because I had very little information about what would be required from the adult leaders. After a week I received a reply from the Central Minnesota Council. They would be glad to have me join the crew if it still worked for me to get vacation time. That would not be a problem. I had already been approved the time off at work. I would have to let the Scoutmaster know I would not be spending a couple of days at summer camp which the troop would be attending the week before the trip to the Summit. I called the council to inform them that I would be glad to attend the Summit. I would soon add a third Boy Scouts of America high adventure base to my list of bases attended. Camp Watchamagumee was the place to be for the Boy Scouts of Melrose Troop 68 during the weekend of May 17-19. The six Scouts, including four new members, and two adult leaders may have got a bit damp during the evening hours but they had a lot of fun during the day. Friday night was a pretty laid back schedule. The troop left Melrose about 6:30 pm. The boys spent the evening setting up camp, reviewing fire safety rules, and enjoyed sitting around the campfire until the first drops of rain send them running for the safety of their tents. The Scouts had a busy Saturday schedule. After breakfast they worked on their advancement and began building their primitive shelters that would would sleep in that night. It did not take long to discover that the boys did not bring along enough tarps and plastic sheets to build what they wished to build. After a lunch of baked beans and hot dogs roasted over an open fire the troop played a round of nine holes of disc golf. Saturday afternoon was time for the annual Egg Drop Competition. Each of the Scouts received a raw egg. Their challenge was to create a package for their egg using other natural materials found around the campsite. These packages would than be dropped from higher and higher distances until only one egg remained. Daniel Klassen was this year’s Egg Drop Competition winner. He took home a Boy Scout campfire cooking grille as his prize. The next event tested the Boy Scouts fire making skills. Each boy was to start a fire and keep it going long enough to burn through a string seven inches above the ground. Matches were not allowed for this contest. The Scouts needed to start their fires using flint and steel. A strong wind turned out to be the villain of this event. Even though the Scouts created hundreds of sparks, the wind blew out many of the flames the boys were hoping to use to start their fires. Alex Engelmeyer was the troop’s winner of this competition. The boys finished the afternoon by finishing their primitive shelters, playing a couple of games, and making a great supper of fried potatoes and spaghetti and meat sauce. There was not much food left over. The boys had worked up quite an appetite. A short chapel service was held at 7:30 that evening. This was followed with the boys moving their sleeping bags and pads into their primitive shelters for the night. As the Scouts gathered for the evening campfire they learned a troop song about Camp Watchamagumee, heard the story of the Purple Gorilla, and learned how to protect themselves from a wolfen attack. Half of the Scouts discovered that their primitive shelters did not do a sufficient job of keeping them dry once the rain showers moved in overnight, but a couple did stay in their shelter for the entire night. Important lessons were learned which will be used the next time they build a shelter, which could be as soon as their June weekend outing. Attending the Watchamagumee outing were Boy Scouts Alex, Daniel, Zack, Adrian, Sam, and Macoy. Adult leaders for the weekend were Scoutmaster Jim and assistant scoutmaster Eymard. Committee member Steve provided program assistance. The troop would also like to thank Melvin and Vern Klassen for allowing them to use their land for the outing. More pictures of this outing can be found on the troop’s website. I have not camped out even one night during 2012, and it looks as if this year will be my first year without a camping trip since 1979. 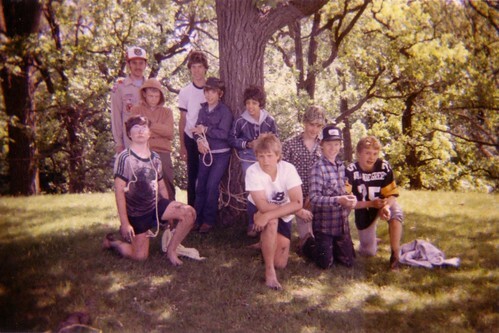 I began camping with the Boy Scouts of Troop 68 when I became an assistant scoutmaster in 1980. There were a lot of camping trips during the next 32 years, both long term and short term outings. This is not to say that I did not attend any troop activities this year. I did attend a weekend outing at Camp Stearns in March, but we stayed in a lodge. I did spend most of a day at Camp Watchamagumee in May but I did not spend the night. I did visit the troop for a day at Many Point Scout Camp in July but left when it was time for the evening campfire program. I was going to spend the weekend with the boys for a June camping trip at Kings Lake but it was cancelled due to a lack of participants. The August canoe trip was attended by several parents so there was no need for me to tag along. I was going on a weekend camping trip with some former troop members in May, but it rained that weekend and everyone backed out. It seems strange not to use my camping gear. Usually, I would have to pack up for at least five or six outing each year. My rain gear remains dry. My cot remains folded and my mat remains rolled. My eating utensils remain clean. It is kind of weird, but it was my own choice. I wanted the Scouts, parents, and new adult leadership to understand that I really have stepped down as the scoutmaster and that they should not be relying on me to attend the troop’s outings as they have in the past. Will I get back into camping with the troop during 2013? I am not sure yet. We will have to see how things turn out, but yes, I would enjoy camping with the Scouts again in the great Minnesota outdoors. I think everyone now understands that we have a new scoutmaster but that I am there if I am needed. Besides, I enjoy camping and I think I still have a skill set to offer the troop. Summer Camp or Amusement Park? I had a dandy dream this morning. I paid an “out of season” visit to the Buckskin Camp of Many Point Scout Camp to check in on the campsite Troop 68 has been using for a number of years. I was quite surprised to find the camp staff at the Seton campsite preparing to set up the new climbing towers. This shocked me! But I knew the camp was making improvements. After all, in real life a new Handicrafts Lodge and Nature Lodge had been built this year. Back to the dream, I decided to help the staff prep the site for the new towers. The campsite would actually be a decent site for the towers, more centrally located, but I had always thought the old site was a good place for the towers also. Oh well, our troop would have to move to a different campsite next year. In the dream I left the campsite for a moment (it seems to be just a few minutes). When I came back not only where the two towers completed but other things had been added. There was a new course for gas-biking (? ), and a short zip-line which ended at a new small manmade lake. And there was still more construction going on for other things. My first thought was that the Seton Campsite is not this big! (Typical for a dream, isn’t it?) My next thought was that they are turning summer camp into an amusement park. It is at this point that I woke up. Needless to say, I was a little upset and confused when I woke up. Then I began thinking. I hope I never see a Boy Scout summer camp turn into an amusement park atmosphere. That would really kill the whole premise of the Scouting program. Valleyfair, Six Flags, and Disneyland are not good places to earn merit badges and learn life skills. This is one dream I do not want to see come true. It has been over 25 years since 1985 came to an end. It was a busy year for the Boy Scouts of Melrose Troop 68. They went to winter camp at Parker Scout Reservation, attended the council’s Ripley Rendezvous at Camp Ripley, held a spring pancake and sausage breakfast fundraiser, went to camp Watchamagumee in the early spring, hopped onto their bicycles for a weekend outing in June, attended summer camp at Tomahawk Scout Camp in Wisconsin, visited the Minnesota Renaissance Festival in September, took part in a city’s emergency drill in October, and even found time to hold a few courts of honor. Like I said, it was a busy but very fun year. Here is a slideshow featuring pictures from those events. Leave feedback here, at iTunes.